I love my “Home Alone” food, thrown together finger-snap fast. 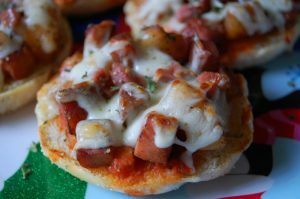 My favorite lately… English Muffin Pizzas. Split an English muffin, regular or gluten-free, and toast them in a toaster. Then cover each half with your favorite grated cheese. (I love cheddar, parmigiano or crumbled feta.) Run the cheese-covered halves under the broiler until the cheese gets bubbly. Take them out and add whatever you have around – tuna and capers; or diced olives, crumbled sausage, or leftover chopped broccoli. That salsa on the fridge door? Sure, put on a spoonful. Throw a slice of bacon in the microwave and add the chopped crispy pieces to your little pizzas. I love eating this way.